I might not live in the country anymore, but my stomachs heart will always live in North Carolina where soul food thrives. I am sorry to all my health conscious friends for what I am about to say, but lets be honest. Anything fried is damn delicious. 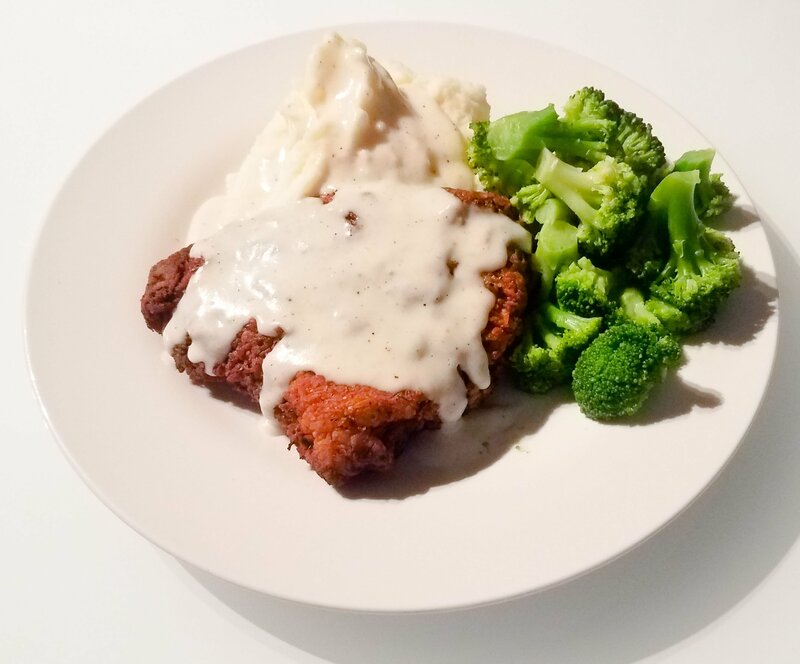 Chicken Fried Steak is no exception and with most ingredients we have at home, you can have a home cooked meal in under 40 minutes! All the ingredients are listed at the bottom for you to prepare first! First and foremost, peel all your potatoes and rinse well under a colander. Chop the potatoes into small cubes, trying to keep them all uniform in size so they all cook at the same time. While you are doing so, make sure you put on a large pot of water to a boil. 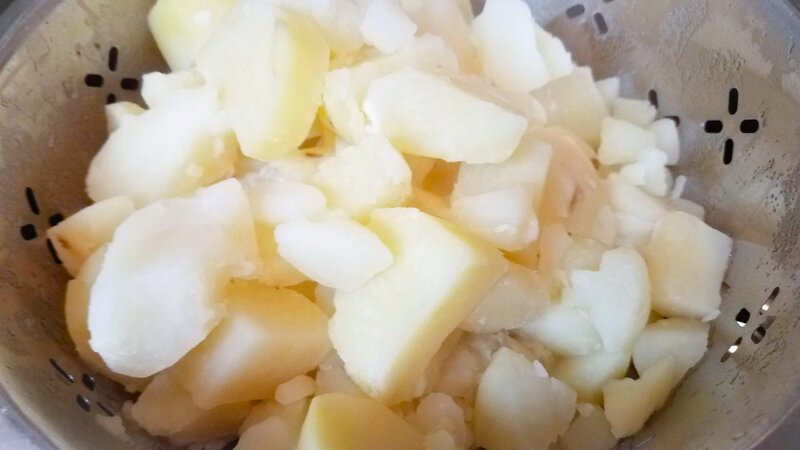 When it comes to a boil, dump your potatoes and boil until fork tender, about 20 minutes or so. Fork tender potatoes that are uniform in size are important for smooth, creamy whipped mashed taters!! This is where the easy part and MAGIC comes to play. 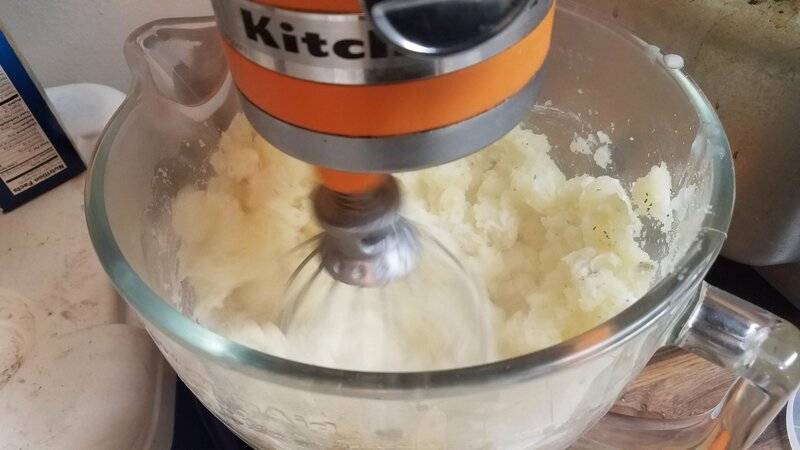 I swear by using my kitchen aid mixer and whisk attachment for the BEST mashed potatoes. Take the boiled potatoes and put them in the mixer. 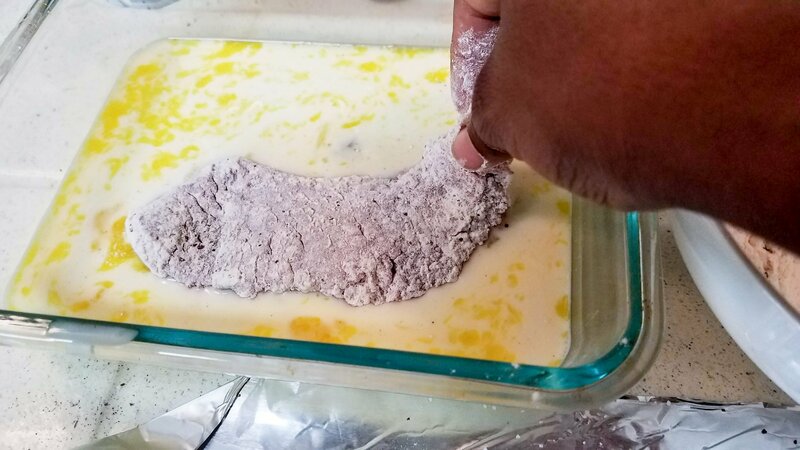 Melt half a butter first and then add the cream to warm up. Melt the butter down BEFORE adding the cream! Sour cream makes potatoes sooooo dang good. Whisk until all smooth and do NOT forget to scrape them sides!! No one likes lumpy mashed potatoes. Ewwww. 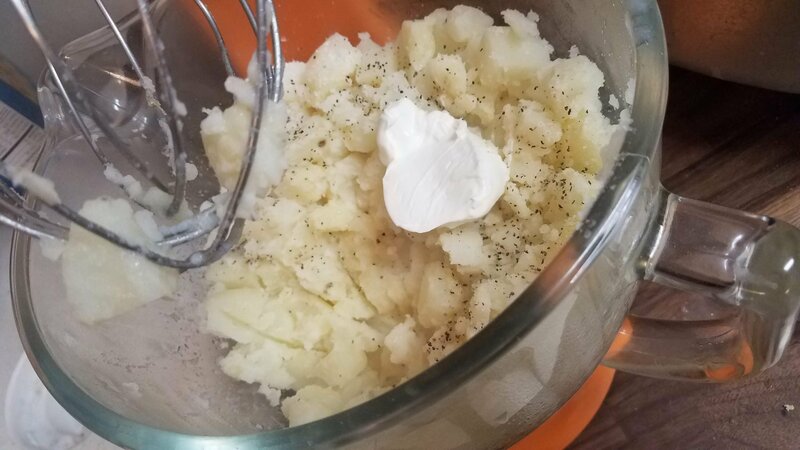 When the mixture has heated, pour over the potatoes, add sour cream and season with salt and pepper! Whisk while stopping to scrape the sides until all are combined and taste for seasoning adjustments. VOILA. Easiest mashed taters of your LIFE. 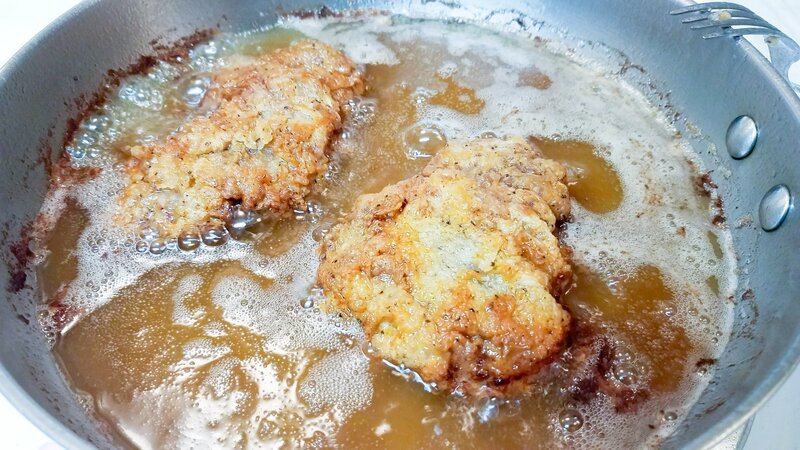 Now comes the fried glory of the story….our Chicken Fried (or country fried for some of you) Steak. 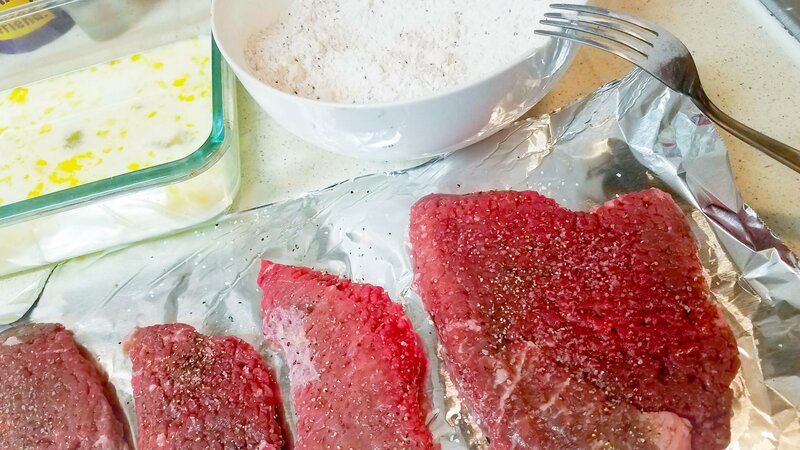 Take 4 cube steak filets , rinse and pat them dry followed by seasoning them with salt and pepper. Grab 3 dishes and set an assembly line as so: Egg/Milk Mixture —>Flour/Seasonings —> Clean plate. Steaks prepped, seasoned and assembly line about to be in order! Before you begin, place 1/4 cup of canola oil over medium high heat in a shallow pan. You also want to heat an oven to 350* in the meantime. In the first bowl whisk the milk and eggs together. Grab another bowl and add the flour, salt, paprika, garlic powder and onion powder. 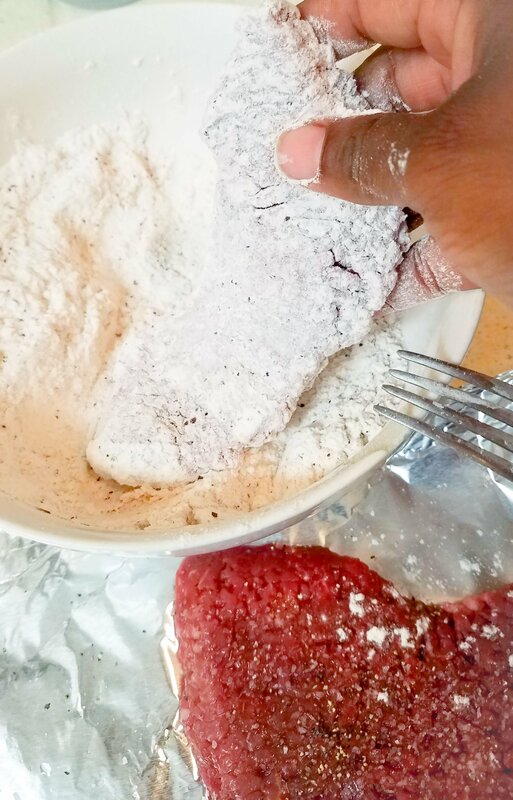 Dip the steak in the flour, then into the egg, BACK into the flour and onto the clean plate. Final dip into the flour! Once the heat is up to temperature, fry your steak on either side for about 3 minutes (or until edges are golden). 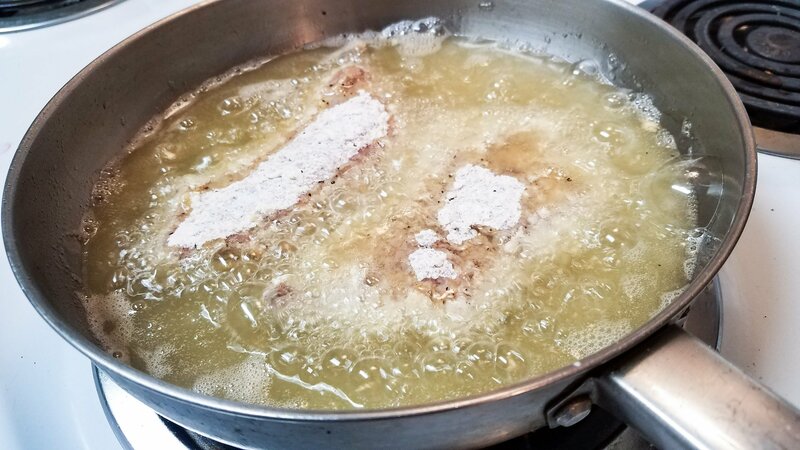 Drop the steaks in when the oil reaches temp..be careful for that splatter! Edges are getting golden…..that means its time to get to FLIPPIN! Look at that fried southern goodness. Thank GOD dinner is soon!! Place the steaks in preheated oven for about 10 minutes after frying to make the steak more tender and to ensure it’s cook thoroughly. OH white gravy….how I LOVE YOU SOOO. This is quick and easy so you can eat soon, I promise. 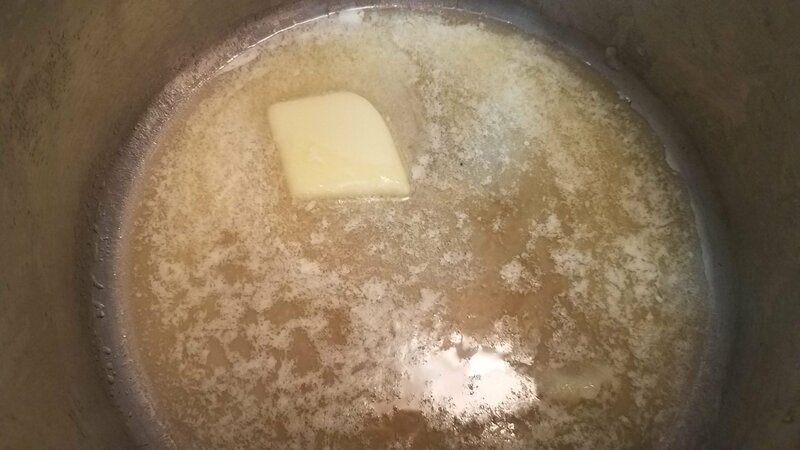 Add 2 tbsp of butter and melt over medium heat. 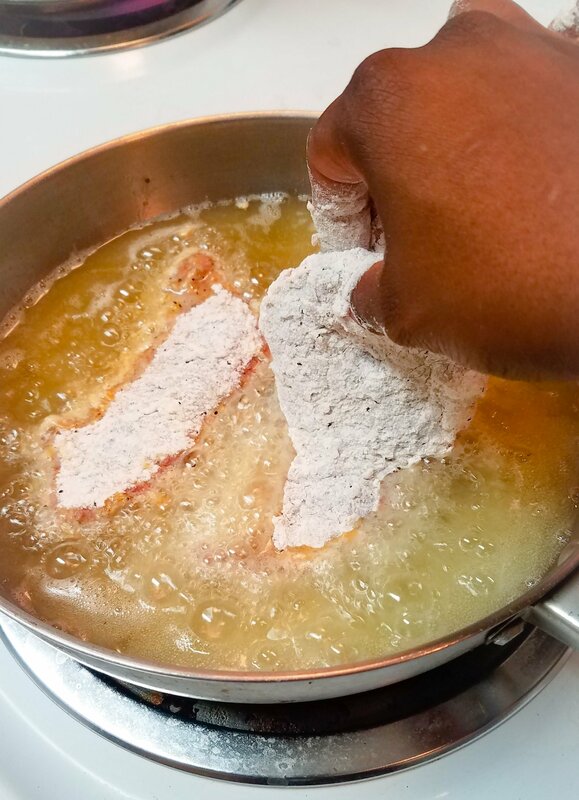 Add 2 tbsp of flour and mix to make a roux. Pour in one cup of milk with salt and pepper (about a 1/2-1 tsp of each). 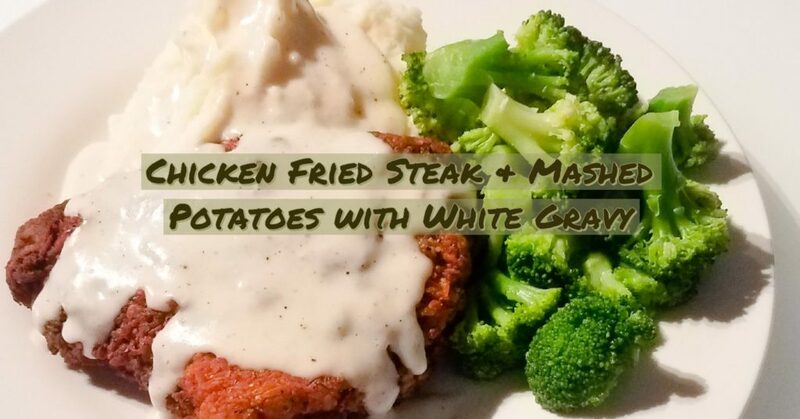 Whisk until smooth and pour this savory gravy over the steak and mashed potatoes and ENJOY! You can find all of your ingredients at Safeway at an affordable price! Serve with your veggies of choice and CHOW DOWN! Previous Post Shakshuka: One Pan Breakfast!